RiNGLEY teething toys are awesome for three reasons: 1) made of all natural products– untreated wood and organic cotton; 2) combines two textures to meet baby’s biting needs: terrycloth friction and the smoothness of the hard wood; 3) can be used wet or dry. I was sent one of these to review and it quickly became a staple diaper bag item. While we do use a baltic amber necklace on my daughter to alleviate teething pain, she still has the need to chew on things while teething and has absolutely loved the RiNGLEY. Since receiving it, we have thrown away all other teething toys and now refer to our RiNGLEY as “The Bite Toy.” It is a fabulous product and one that I think should honestly be in every parent’s tool bag. Why I never thought to invent my own, I don’t know. http://rcm.amazon.com/e/cm?t=life0fd-20&o=1&p=8&l=bpl&asins=B002GXHKUC&fc1=000000&IS2=1&lt1=_blank&m=amazon&lc1=0000FF&bc1=000000&bg1=FFFFFF&f=ifrRiNGLEY provides babies and toddlers with two safe and efficient textures that enable children to satisfy their teething needs. 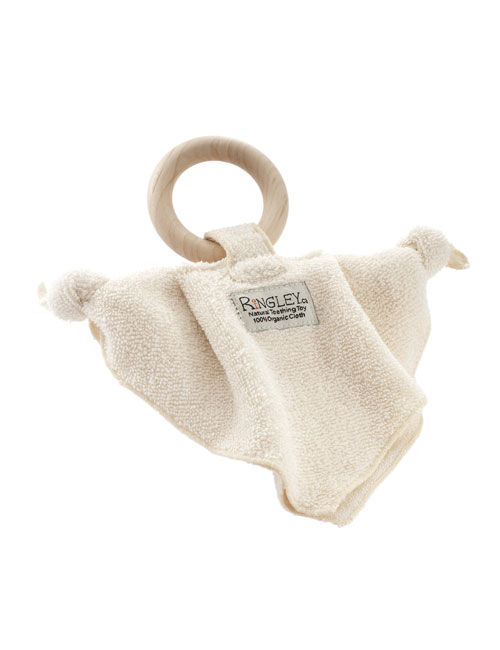 RiNGLEY’s design allows your child to easily grip the ring and cloth. It can be used wet or dry and easily reaches around a child’s gums and teeth. RiNGLEY was designed with a child’s development in mind. Since infants learn through tactile stimulus, touching and putting things in their mouths, the need for a product made without harmful chemicals and dyes is important. RiNGLEY is an organic and natural toy for babies to chew and teethe on. The four styles range in price from $16.00-$20.00 and all can be unattached from the wooden ring (velcro type enclosure) to ensure washing abilities. We received the “junior” style to review (see photo at the top of this post) and have found that it’s the perfect size for little hands and mouths, and a fun shape for even playing with (my daughter really enjoyed playing with the knots). We’ve been using it for months now with no signs of wear. If the knots come undone, you simply re-knot the end. I LOVE this teething toy and am so glad I found out about RiNGLEY! You won’t regret buying this for your own child or as a gift for another child. It’s the perfect way to provide a natural product to help your child cut his or her teeth! Win It! Check out RiNGLEY’s selection on their website and let me know which style you’d prefer. Be sure to include an email address and separate comment for each entry! Contest will end Monday, 8/20/10, at 3pm EST. Tweet about this contest with a link (max 2x/day, at least 2 hours apart). Include @lifemoresimply.